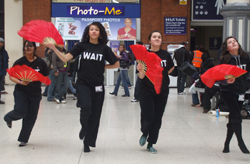 Supported by several parents and a WAIT UK partner on Saturday 3rd of April, WAIT members embarked on a day of performances and fundraising in the busy Victoria Station in Central London. Ideally, we were to meet at 9am sharp in order to register and set up. Ironically, due to maintenance work on the rail network, almost everyone arrived a little late. We were allowed two slots for performing (10-11 am and 3-4 pm), but fundraising all day in the unrestricted areas of the station. Priya Loganathan, WAIT girl coordinator, prepared a schedule for the day which included times of fundraising (in pairs), breaks and performances. Overseen by Sean Greaves, WAIT Youth Coordinator, the fundraising day began in earnest! In the afternoon, we were joined by eight-strong members of performing arts group, Dance Physics. They entertained us with an amazing twenty-one minute modern dance routine, choreographed by Annarita Mazzilli. During their performances, the WAIT members presented Break dance, the Rose Dance, a new girls dance, and the songs, Respect and Save Yourself. The audiences were genuinely interested in and moved by these performances! 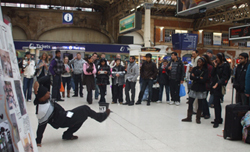 Although a tiring day in the end, everyone enjoyed the fun and excitement of a very public performance by WAIT UK. We raised a decent amount of money to help support our projects in the UK, as well as in Uganda and South Africa. We are extremely grateful to Network Rail for allowing us to fundraise and perform, but also to Dance Physics for their lovely support, and of course WAIT parents, without whom we could not have done so well. Thank You!! !